Diary of a Miner: I'VE CRACKED IT!!! I've cracked it! The book! The runes in the book! I've cracked them! It was so simple; I knew I'd seen them before! When I was young i was fascinated by code and other stuff like this! Me and a friend back in primary school used to send notes to each other using something very similar. It was so obvious, it was staring me in the face! PIG. PEN. CIPHER!!! A simple monoalphabetical substitution! 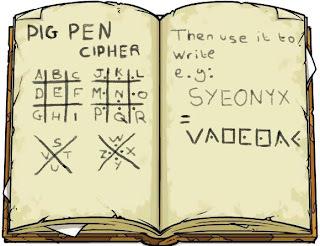 With an example grid used for the real pigpen cipher, I can decrypt this book in a matter of hours. I just hope then that it doesn't contain a secondary level of encryption... then I would be stuffed! I've just decrypted the title of the book... Oh! It's in Latin, I think... I suppose what better language to write a mysterious book in then a dead language! Either that, or this book predates modern languages! It just says "CODEX SOLIS". Well from that I can only assume it has something to do with the sun, and codex refers to a book or something similar... So roughly translated... this book is called "The Book of the Sun"! 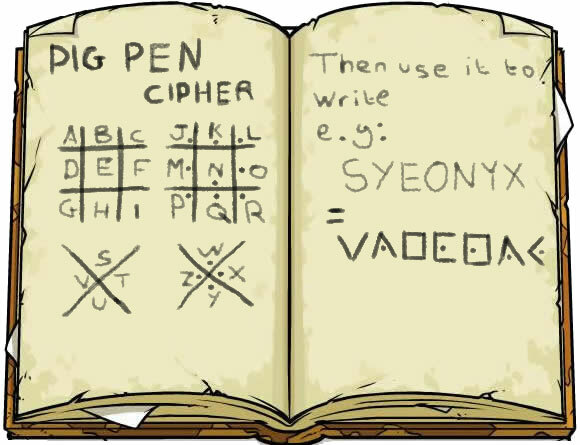 Further decryption just reveals more latin, although there's constant reference to the word "creep" and "serpere". A snake? Possibly... I need to send this to HoN Co. immediately and see if they can get someone who's familiar with Latin on it! It's going to take some time decrypting it all though. I have still yet to hear back from them about the strange blue stone/powder I found! Chiron is still staring out of the window! I daren't go out to investigate. I have my bow and sword... I even have my armour... but what use are they if there are exploding creatures out there? I fear for my life at the moment; I don't know what to do... HoN Co. told me that I was the only person in this land... 'the only other inhabitants are animals' they said. Well tell that to the zombie and the weird green creature! Still loads of references to "serpere"... is there a snake I have to worry about now? The same with "solis"... I think that refers to "the sun", or maybe "of the sun". The latter makes sense in relation to the book title. I really hope HoN Co. contacts back soon; I need answers!